Repurposing content, as the name suggests, means using your existing content for a purpose other than the one for which it was originally intended. When you repurpose your content, you either change the format of that content, the target audience, or both. Repurposing content is entirely distinct from revamping or updating it, because the latter involves using the content for the originally intended use, but sprucing it up so that it stays relevant for the target audience. So, a revamped blog article might contain extra information that gets added to it over time as you increase your industry expertise. As part of your overall content marketing strategy, repurposing content plays an important role. Every company’s prospects go through what is known as a marketing funnel. This essentially represents a series of distinct steps that each of your prospects goes through from the time they first interact with your brand until the time they make a decision to consume your product or service, otherwise known as a conversion. Since a set of distinct steps constitutes a marketing funnel, the overarching aim of repurposing content is to target customers at different stages of the process. For example, the people who are first being introduced to your brand have different preferences for how they receive information on your product or service than those who are at the more advanced decision stage. By repurposing a written collection of blog posts into a guide, for example, you can reach out to people at the decision stage of the marketing funnel who might buy your guide. The blog posts remain on your website as a way to attract people who are at an earlier stage, when they are just familiarizing themselves with your brand. Creating stellar content takes time and a lot of effort. Repurposing your content by changing its format is often an effective way to maximize the effort you put into content creation and marketing for each piece of content. The truth is that sometimes, the original format in which you post your content might not lead to lots of traffic or sales. You might have a stellar blog post or two related to some important topic in your industry, but for whatever reason, these posts never got much traction. By repurposing this content as a podcast, you can reach out to people who missed the original blog posts. Repurposing content gives you the chance to maximize the reach of your best content, making it more likely that it gets the recognition you feel it deserves. A nice benefit of repurposing content is how it enables you to promote your content across multiple marketing channels. A YouTube video based on a blog post can link to the post that inspired the creation of the video, and vice versa. An infographic developed for posting on Pinterest can link back to the original article on which it is based. By cross-promoting on different channels with repurposed content, you get the chance to increase brand awareness. An important factor for an effective content marketing strategy is not putting all your eggs in one basket. In other words, you need to diversify by spreading your messages out across various media. Repurposing content allows you to incorporate each of these media into your marketing strategy, thus reducing your reliance on single channels for communicating with your prospects. 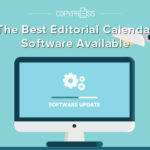 Even though plenty of work goes into repurposing content and making it suitable for another platform, it is sometimes more efficient to do this than to come up with new content. When you repurpose your content, you already have a lot to work with. You have quotes, images, data, and figures, all of which markedly reduce the time you need for research before publishing. The truth is that while posting new content consistently is always a good idea for your content marketing aims, there is not always something new to talk about. By repurposing existing content, you supply a fresh perspective on popular topics that is often as valuable as publishing something completely new. Social signals contribute to how highly your site ranks in search engines. When you repurpose content, you often do it to appeal to a different target audience than the one you originally intended to convey your message to. So, you might turn a popular blog post into an image optimized for Pinterest. If the image also becomes popular on Pinterest, you improve your SEO results by getting more social shares, thus improving the search engine results of the original web page that the repurposed Pinterest content links to. 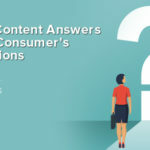 One potential pitfall of repurposing content is the possibility of it being construed as simply duplicating your content. Many businesses rightfully worry about SEO penalties or turning their prospects off when they see the same content marketed in a different format, but skillful repurposing should obviate this concern. Repurposing content is not a mere copy and paste job, and it doesn’t lead to duplicate content penalties, as Google’s Matt Cutts elaborates on here. By taking the best ideas from certain pieces of content and repackaging those ideas in another format, you are creating something new and something of value. In instances where you can’t avoid copying large chunks of information, such as when repurposing blog posts as a guide, it’s always a good idea to add something new to the repurposed content that makes it stand out on its own as worth buying or downloading. The following examples show you some of the best ways you can repurpose your existing content so that your business can take advantage of some of the many benefits associated with repurposing. Infographics provide a host of benefits as standalone pieces of content. Infographics are eye-catching, which makes them more shareable. Additionally, infographics help you connect with your audience, and they even improve your SEO. Some people prefer to engage more with traditional blog posts than with infographics, though. 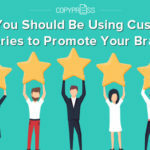 Basing a blog post on a successful infographic gives you the chance to repurpose this content so that it appeals to more people. Infographics are great for quick reference and visual data, while blog posts go more in-depth about a topic. Each type of content appeals to different people, so make use of them. Another effective way to leverage the value of a compelling infographic is to host either a webinar or podcast around the infographic’s main topic. Webinars and podcasts give you a chance to repurpose infographic content in a more interactive way. The natural flow of podcast conversations allows you to go out on tangents, providing extra information that the infographic doesn’t contain. Similarly, webinars allow you to go into more detail about a topic and add a more educational aspect to it by delving deeper. White papers are powerful marketing tools that you can use to repurpose existing content, especially topics which generate a lot of discussions and/or traffic for you. 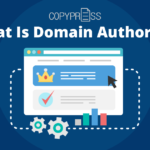 Since the language used in a white paper is distinct from that of a blog post, repurposing blog posts for use as white papers gives the content an added freshness. White papers can also be perfect tools for improving your email marketing efforts. By offering a free white paper in exchange for prospects’ email addresses, you give a compelling reason for people to subscribe to your newsletter. Consider turning your best blog posts into videos to maximize your content marketing efforts. People often find it easier to engage with a video than to read a long blog post. 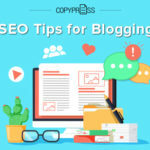 All you need to do is create a script based on the key points of your successful blog article and record someone at your business discussing the topic. You can then upload the video to any of the many popular video-sharing platforms on the internet, including YouTube and Vimeo. By building an audience that interacts with your videos regularly on several of these platforms, you diversify your messages. 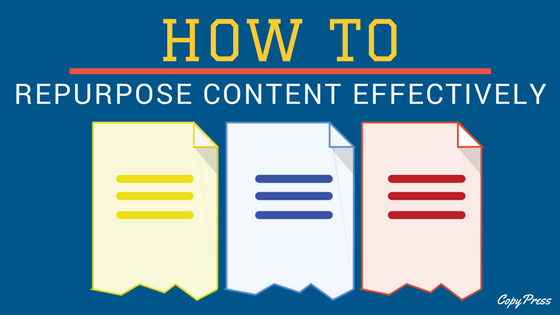 After publishing each piece of content, you should immediately begin to decide how you can repurpose it for maximum value. Consider some of the examples above and perhaps come up with your own repurposing ideas to reach more people.